Last Walk of the Season ... Next Season it could be You! One of our final game walks of the season has just taken place at Siwandu... The two guests on the walk were in the experienced and capable hands of Mpoto, our walking guide, and Isaac Rotich, our Gold Member KPSGA* guide from Kenya, who has been helping us at Siwandu with training guides to be FGASA** Level 1. The walking party left the camp at 6.30am, just hours after a violent storm had passed through the reserve, lighting up the camp with stunning lightning displays, fierce gusty wind and shaking the camp most of the night with it's cracking thunder! Disappearing into the calm of the dawn, the walkers were spoilt with so many visible tracks left in the muddy ground - hippo, impala, giraffe and wildebeest. They quickly came across a fresh kill - a female Impala, taken down by a leopard - her carcass, with the brisket and hind legs eaten, had been dragged from kill site to a place under a small tree, so the cat could eat in peace ... but the walking party had clearly disturbed her and they could see fresh leopard prints running away from site and they could also hear Impalas making alarm calls close by..so she was on the hunt again. However a hungry hyena was not so worried about the humans and was trying to get to the fresh Impala carcass..so the group went on and left him to his newly sourced breakfast. As the party continued towards the bush breakfast spot, they stumbled on a hippo out of the water, just 3 metres away from them ... Mpoto was now on high alert to this new danger - outside of the water hippos are solitary and can stampede. Eventually the hippo slowly wandered off into the lake, leaving the guests now able to walk on to the breakfast site and enjoy a hearty bush breakfast - bacon and eggs with all the trimmings, freshly cooked by our chef on site - what a way to start the day and to end the season out here in Siwandu! Next season, it could be you! Siwandu, along with Jongomero and Ras Kutani will be closing for the rainy season tomorrow and reopening on June 1st. Thank You for supporting us in the 2014/2015 season - and for sharing in our lives via our blog site and other social media. Looking forward to sharing more stories in the 2015/2016 season... and we hope to see you at the camps very soon! 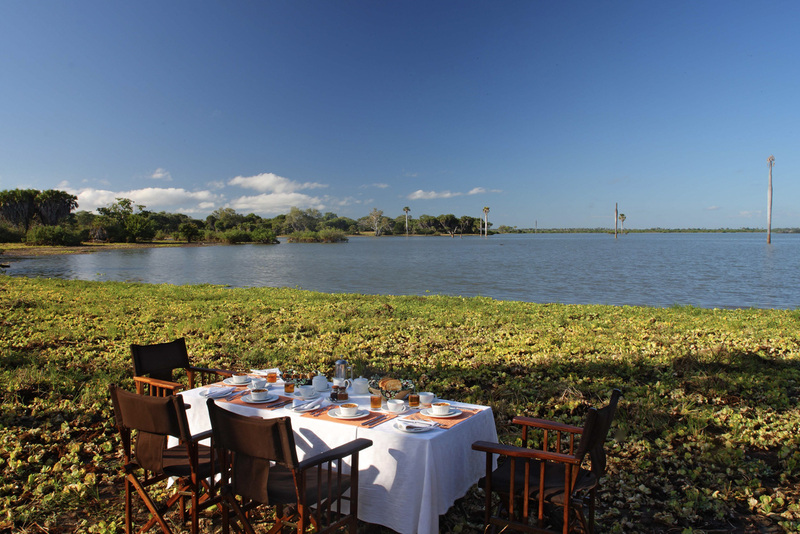 Selous Safari Company's recent project in Ras Kutani showcases commitment to sustainability.